Report: Hundreds Of Troops' Ashes Were Dumped In Landfill : The Two-Way "The incinerated partial remains of at least 274 American troops" were disposed of in a Virginia landfill instead of being treated with dignity as families were promised, The Washington Post reports. That's far more than first reported. 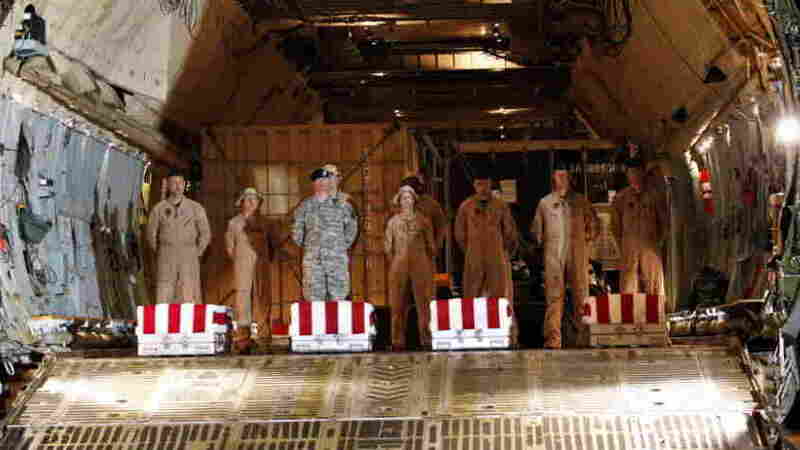 June 8, 2011: The coffins of four U.S. soldiers killed in Iraq arrive at Dover Air Force Base. On Morning Edition today, the Post's Crag Whitlock added that "almost undoubtedly" there are even more cases, perhaps going back at least to the 1990s. The Air Force says it ended the practice in 2008. The Post has been ahead on this story, which has been emerging over the past month or so. As NPR's Tom Bowman reported in early November, at first it was thought there had been just a couple instances of partial remains being taken to a landfill instead of — as families had been assured they would be — being buried at sea or in some other dignified way. Now, the Post has uncovered records that expose more of the "embarrassing episode for vaunted Dover Air Base, the main port of entry for America's war dead." And, Whitlock told Morning Edition host Steve Inskeep, the newspaper has emails indicating that disposing partial remains in a landfill "was the practice going back to the '90s." As Whitlock said, troops in Iraq and Afghanistan have been involved in combat where "a lot of people are killed by bombs or die in explosions" that shatter bodies. "In many cases," he said, "what happens is the morgue at Dover isn't able to identify all the remains until after a funeral or until a body is returned to a family" — meaning that some body parts have remained behind at the morgue. "What happened in these cases," Whitlock said, "is the families had signed paperwork asking the military to dispose of these subsequent remains in a dignified manner. ... The Air Force would have them cremated ... and then have the ashes taken to a landfill. The families were never told about this." Some remains that were never identified were also disposed of in the landfill. There have already been investigations of the practices at the Dover morgue. More are now likely.